We have yet another bank holiday Monday tomorrow, so yet another 3-day weekend for me, yay! This one hasn’t been warm, or sunny, or dry. I have laundry on the line to dry, but I’m in sweatpants and a tshirt with my fuzzy warm ‘smoking jacket’ on over it. It feels and smells like a cool October day, not early June. But I’m still outside! Unlike the hubby who seems to be trying for the record of ‘most crappy TV watched in one day.’ On my trips inside for this and that I’ve heard: an Aussie Baptist preacher spouting whatever nonsense he was spouting, BBC Jubilee coverage, bad Irish commercials for upcoming family events around the country, The Big Bang Theory (twice), The Simpsons Movie, and most recently both Big Daddy and one of those Honey I Shrunk the Kids films. This after we watched Battleship, with his finger on the fast-forward button. I napped, then when I woke up and it was still on, I left to go do more gardening in the cold. Terrible, truly terrible, movie. We also watched Iron Sky – which is one of those I’ll have to watch again to see if it was bad or funny. I did laugh a lot, but it felt a bit forced even to me. Very much a political movie as well, which went oddly with the humour. Anyhoo, I took a few photos of my plants on Friday evening. They aren’t great pics, except for one. Should I start with that one? Ok. it wasn’t dark out – its just a quirk that the background is nearly black. This is one of two massive blooms on my white climbing rosebush. 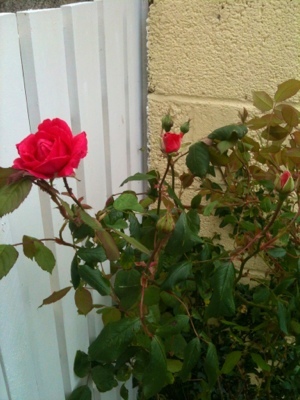 I bought four rose plants a few years ago for €1.99 each from Aldi, and this one alone has proven to be worth the price of all four and then some. It was supposed to be planted out front, but I messed up and didn’t identify them properly. 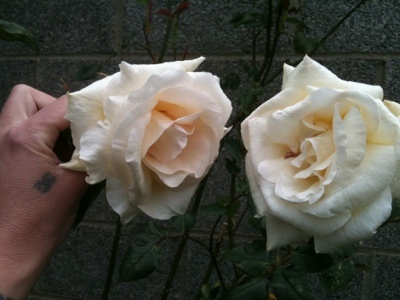 This is after I left them in a bucket of water for about a month (they were bare-root roses). In other words I did my best to kill them! But I’ve never had roses and they were so cheap, I really didn’t expect them to live. My intention was to put the two climbers out front, the white and a pinky-red. Then out back here, a lavender and a true red. Well, oops. The non-climber red one is a let down, its too pink and is a bit, well, boring. The lavender one has absoloutely gorgeous, if small, blooms but it nearly died two years ago and is only about 1.5 feet tall. It does have two buds on it now though – yay! They all got a feed today, too. 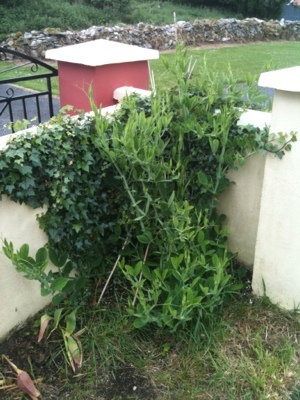 Here’s the climbing rose out front – it was drooping way over so I wired it up to the wild ivy I let grow on the wall. Probably much to my neighbour’s chagrin – it’s technically his wall. Now, these sweet peas are just only getting started. See that patch of bare dirt at the bottom of the frame? It’s bare because these friggin’ things go mental every year. They come a good 8 feet out into the grass and then go across the driveway! Again, I planted let wild ivy grow in the corner so the sweet pea had something to hold on to, and I put bamboo canes in a teepee formation in the hopes that they would go up and over the front wall instead. I’ve been working on that for a few years, but this year my plan seems to be working – the pea is mostly vertical and holding on to that ivy. Man, my neighbour must hate me. Also in shot – the pathetic remains of my tulips. They were expensive, and hard work to plant: lovely dark purple and white/purple variegated, but they just don’t like it there. This year after the foliage finishes dying I’ll dig em all up and find a better home for them. Somewhere. Maybe in pots? I have most things in pots, due to lack of good soil, the massive slug problem (hate them! killed a dozen today at least), lack of room and the lack of any real plan for my garden. 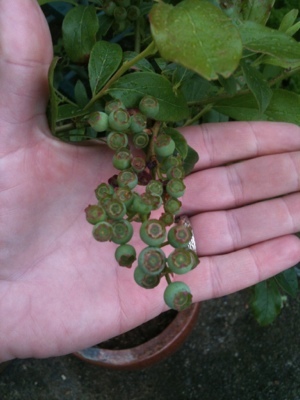 My blueberry bushes are in pots, and the warm weather made the one I bought last year double it’s fruit size in just a week. Yum, yum yum. Can’t wait to be going out every day and picking the ripe ones. So far we have no problem with anything eating them – the birds don’t seem to know what they are. The strawberries are in the ground, not pots (despite birds and slugs knowing just what they are) and are the very first thing we planted when we bought the house seven years ago. 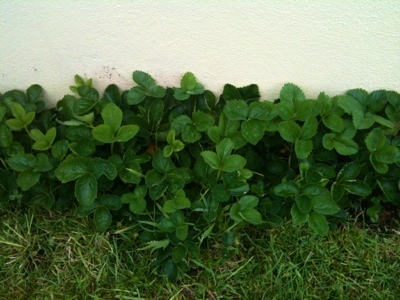 This pic is of slightly more than a third if my strawberry patch. Unfortunately it seems they have a limited life span, despite all the new plants created every year. I don’t even have a single bloom, much less a berry. I hate killing plants, but I think I’ll have to dig them all up and buy new ones next year. Sigh. I think I’ll stop here – I could keep going but this post is already a bit long. By the way, even iDJ finally realised he was wasting his Sunday with that ‘Honey, I…’ film. Beautiful roses! I have most of my plants in pots, excep the irises. I wonder if I can do a raspberry bush in a pot? If you can do blueberries…. Yes you can! I was just reading gardening magazines and the said bare root raspberries will grow in pots. I have one I dug up from the wild that is growing! Beautiful rose that big one! Lovely post on a wild wet day! It’s not wet and wild today! I think it’s 18 already at 9 am – YAY! And Battleship is boring? Is that the movie with Rihanna? Oh it was terrible. What I bothered to watch of it! I actually want to watch it too. But I’m not sure if I still want to, haha! I think I might skip that movie! The roses are beautiful! It was 96 degrees in central Florida yesterday and my flowers looked like they were melting…I know I was! Send a little chill our way, please?! 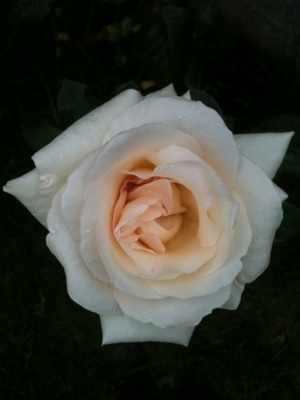 Roses that smell – so envious!